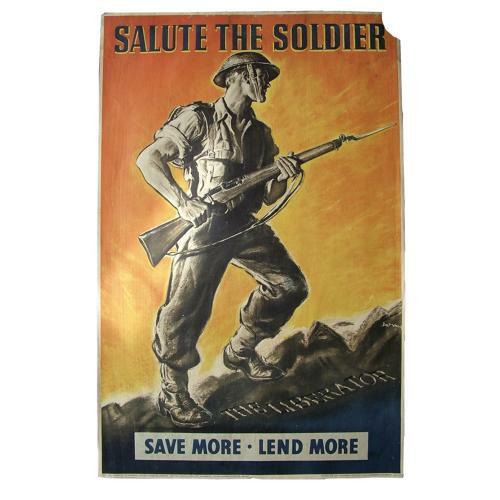 Striking original poster produced for the "Salute the Soldier' campaign. Paper, approximately 50 x 75cm. Issued by the National Savings Committee, London, The Scottish Savings Committee Edinburgh and the Ulster Savings Committee, Belfast. Printed for H.M. Stationary Office by E. S. & A. Robinson Ltd. Bristol. Small labels gummed to the rear relating to the purchase of savings stamps for the campaign. Loss of the upper right corner, some soiling and creasing but in good displayable condition. Will be sent in a strong mailing tube. Stock code BO4368.